Donarun [info here] -- thanks to wolfshadow for adding this world! hey, how about this; the world of lilo and stitch, part of the beautiful islands of Hawaii... Garden Island! that's what its called? thank you for enlightening me! of course it can be called Kaua'i. The castle is also apart of Aree'sh, formerly ruled under King Fyrnd, who mysteriously disappeared shortly before Draikanaugh took over the world. Outside of the capitol, the world is now mostly consisted of monster infested forests to the east, a vast desert to the west, mountains to the north, and a large ocean to the south. One could say Aree'sh is the safest place to be despite the current circumstances in the town. In the mountains lives the evil Draikanaugh, ruling over all, casting heartless and monsters to do his bidding. yeaah... it looks like death city. but its nothing like death city... so... AWESOME! I'm assuming Soul Eater reference? never cared for the show, but hey if it works, lol. Like I said, not the best on describing but have this awesome world in my head. Just can't seem to portray it in words as well. In all actuality the characters (the one's i'll be mainly rping as and the three others (Agitha, Fyrnd, and Draikanaugh) are all from a story I wrote when I was in High School. Just never got around to continue it after a while. But had an awesome story though. Sorry for the delay, wolfshadow! ;0; (i've been really bad about getting back with everyone lately haven't i haha *headdesk* ;~ Donarun sounds pretty awesome, so I'll add it to the first post. Thanks for posting about it! I'm thinking we could use it for more or less as an extended event. but if needed, we can discuss the world's use over pm. Description: Dawnbreak City is a city forever enveloped In a perpetual dawn. 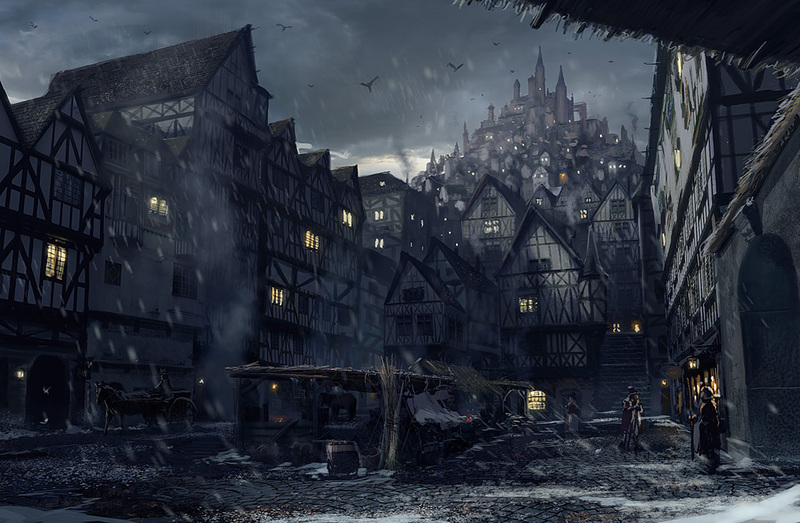 all throughout the town, there are narrow alleys and shops, most with over-priced potions. At one end of the "city," there is a Tall Skyscraper, similar to the one in The World That Never Was. On the other side, A beautifully built church stands abandoned, forever showing a reflection of the sunrise in its stained-glass windows from the hill it sits on. Within the rest of the city, there are various houses, restaurants, and even a struggle arena (I was wondering if with my second character I could hold Struggle tournaments?)! In the very center of the city is a clock tower similar to the one in Twilight Town. On the outside of the city extends a vast forest with an ancient Temple at its heart.